Michael "Mike" Brown is a retired American professional basketball player. A durable 6'9" power forward/center, he played at George Washington University in the early 1980s, where he received the nickname "The New Washington Monument." After four years of college ball, Brown was selected by the Chicago Bulls in the third round of the 1985 NBA Draft. Brown would go on to play eleven seasons in the NBA, "earning a reputation as a workhorse in the low post..." as a member of the Bulls, the Utah Jazz, the Minnesota Timberwolves, the Philadelphia 76ers, and the Phoenix Suns. He retired with NBA career totals of 3,130 points and 2,762 rebounds. He also played professionally in Italy for Aurora Desio, Teamsystem Bologna and Viola Reggio Calabria. Brown was an assistant coach for the Las Vegas Slam of the ABA for the 2001-02 season. From 2002 through 2004, he was an assistant coach for the National Basketball Development League's Roanoke Dazzle. In 2004 he replaced Jeff Capel as head coach of the D-League's Fayetteville Patriots. During the 2007-08 NBA season, Brown worked as an assistant coach for the Chicago Bulls. New Response (Success): recd my card back signed, thanks so much! 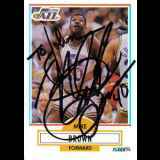 New Response (Success): LOR, SASE, basketball cards Signed and personal..